The Minister of Transport, Chibuike Rotimi Amaechi has reiterated the Federal Government’s commitment to sustain the modest feat recorded in the Transportation sector by providing an enabling environment for the private sector to push the industry to the highest height in Nigeria. Hon. 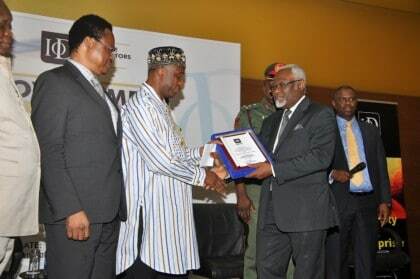 Minister of Transportation, Chibuike Rotimi Amaechi receiving an Award from the President/Chairman of Nigerian Council of Institute of Directors (IoD) while the Past President of the Council, Acr. Awagu, T.C. looks on during the Award giving ceremony at the event in Lagos. The Minister said this while delivering a paper titled ‘Transportation the vehicle of growth’ at the Institute of Directors (loD), Government Meets Business Forum at Eko Hotel & Suites in Lagos recently. Amaechi said that the target of government was to achieve sustainable growth based on three principles namely, rehabilitation, restoration and procurement of platforms. “The principles were deployed so that we do not lose what we have and increase opportunities through procurement” he added. He further explained that in respect of rehabilitation and restoration, the administration of President Muhammadu Buhari has placed more emphasis on completion and repair of existing and abandoned projects and facilities in the rail, roads and aviation sub – sectors. According to him, the essence of the approach was to bring infrastructure to a level that can support productivity and reposition it in a manner that it can be improved upon through procurement. ”For instance, government opted to rehabilitate the Nnamdi Azikiwe lnternational Airport runway, Abuja instead of building a new one” he said. The Minister added that government also completed the Abuja – Kaduna rail modernization project and continued the completion of Warri – Ajaokuta standard gauge as well as rehabilitation of existing narrow gauges . According to him, more than 70 percents of activities of the Transportation Sector are private sector driven. The minister noted that most supposed indigenous private players claiming that they want to invest in the sector do not have enough financial capabilities to achieve this feat but at the end ended up being government contractors or looking for cheap funds. He therefore called on the private sector in the Transportation sector to braze up to the challenges in the industry and reciprocate government’s gesture by investing massively in the industry in order to meet the expectation and aspiration of Nigerians. According to him, the present administration is opened to the Private Sector Participation (PSP) and Public Private Participation (PPP) that would develop infrastructure, put up rolling stocks on lnland Waterways and Railways as well as supportive of investments in manufacturing of spare parts. On the issue of traffic logjams along Apapa roads leading to Apapa ports, the minister promised to work closely with the Minister of Power, Works and Housing, Babatunde Raji Fashola to solve the lingering problem as soon as possible.